Me and my so-called "little" addictions! Look what I have found while browsing the net. 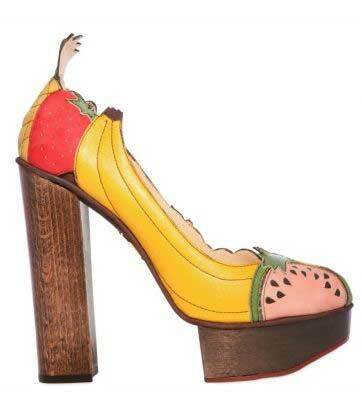 It's a fruit shoe by Charlotte Olympia. I really don't understand why she designed a shoe like this, hmm.. maybe she loves it or someone she knows love to eat watermelon, banana and strawberries? :) This chunky fruit basket turned into a shoe costs £873. Okay, 'nuf said. It may not be the same as Charlotte's but it's definitely a good replica. I actually love the edgy look of this foxy shoe, especially the chunky wooden heel. If you're thinking of paying about £873 (computing.. nah.. never mind), think again. 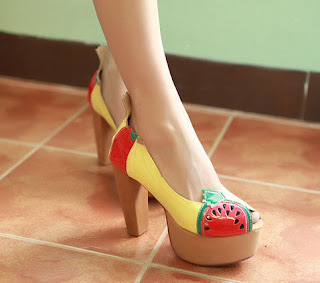 You can drag this fruity shoe design for 1,600 pesos. Just message me and tell me you want that limited edition fruity patootie! Shoes, shoes and nothing but SHOES! Fashion 2012: Pastel and Neon Wedges! © 2011 Reviews and... *stuff*, AllRightsReserved.